We will take you to the top of La Fenasosa in our all-terrain vehicles with trailers for bikes. To enjoy the most of the Bike Park: We will climb to the top of La Fenasosa with our vehicles. Access our booking website and schedule your visit ... right now! The lift system is done with all-terrain vehicles and trailers adapted to the loading of bikes. These trailers are prepared to avoid the blows between bicycles during transport. However, it is advisable to include an adhesive or protector under the main frame tube, to avoid friction with protectors of the trailer. To use the lift service advance reservation is required. You can do it through the reservation system of the web or by phone. Transport in military truck: 1 vehicle with capacity for 18 riders and 18 bikes. 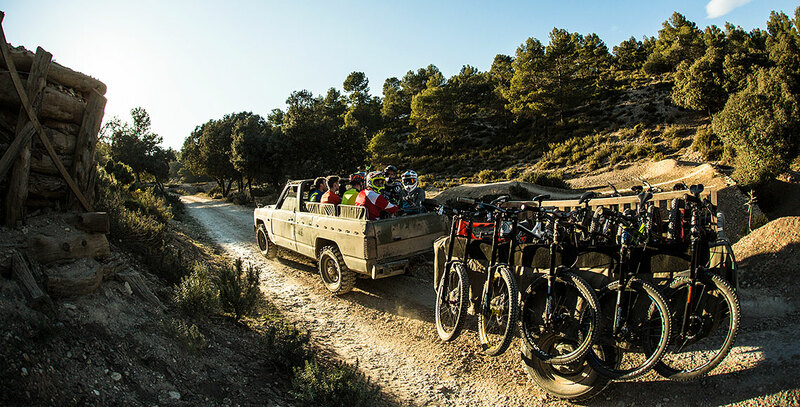 Transport in Pick-Up:5 vehicles up to 9 riders and 9 bikes. Schedule: first morning lift sets off at 10am. Number of maximum lifts daily: morning lifts between 6-8 according to level. In the afternoon 4-5. To use the lifts it is ALWAYS necessary to have first made the reservation through the reservation system of the web or by phone, because every day we plan the lifts that will be needed and prepare the vehicles accordingly.